Buy Vivo V7 for only PHP 12,990 and get a chance to grab exciting freebies. Promo runs from February 1 to 28! Love is in the air, and so is the appetite to shop! 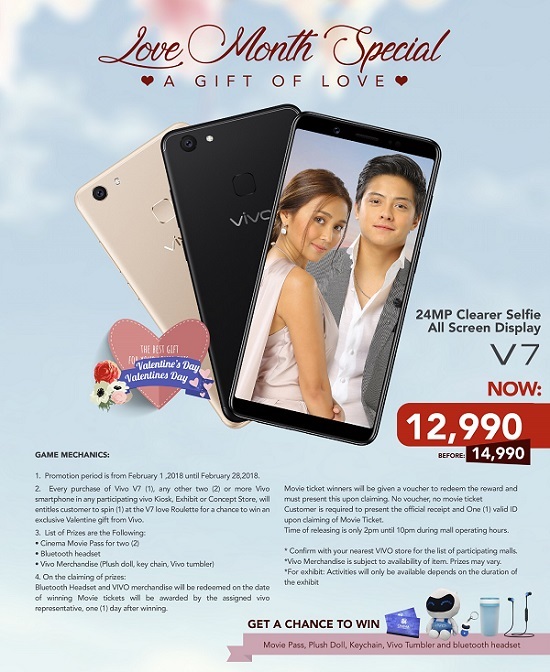 Vivo, the 5th largest smartphone brand globally, is offering an exclusive promo this Valentine's season: Vivo’s Love Month Special. For a limited time only, one can avail the 24MP clearer selfie, all-screen display Vivo V7 for only Php 12,990. To be offered only for the whole month of February, this limited offering also entitles one to win special Vivo freebies. For every purchase of one Vivo V7 or any other two or more Vivo smartphone in any participating malls, entitles a customer to spin the V7 love Roulette for a chance to win an exclusive Valentine gift from Vivo. You can possibly win movie passes for you and your date or any of the other exciting giveaways such as a Bluetooth headset or Vivo items such as the Vivo little V doll, a Vivo tumbler, or a Vivo keychain. Participate in Vivo’s sweet seasonal offer this love month at any of the participating malls and venues: SM Megamall, SMDC Lightmall, Cherry Shaw, SM Marikina, Ayala Feliz, SM Masinag, SM North, Cloverleaf, SM Novaliches, Robinsons Novaliches, SM Cubao, Farmers Cubao, Gateway Cubao, SM Fairview, SM Manila, SM Valenzuela, SM San Lazaro, SM Southmall, SM Bicutan, SM Sucat, SM Muntinlupa, SM BF Homes, Metropoint Pasay, and SM Mall of Asia. Go to the nearest participating malls for more details and mechanics of the promo. Vivo’s Love Month Special will run from February 1 to 28, 2018.